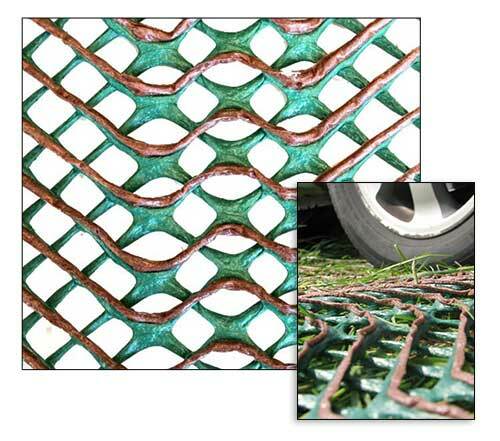 Designed to protect grass areas from vehicular and foot traffic, grass / turf protection mesh helps to distribute the weight and greatly reduce rutting and mud. All of the mesh products referenced are designed to be installed over existing grass and secured with u-pins / turf staples. We offer various grades of material for different applications. If you would like help in choosing the correct mesh grade for your project feel free to give us a call at (800) 524-4161. Vehicle rated protection mesh for occasional usage. Great for overflow parking, foot paths, dog run areas and light aircraft turning circles. Vehicle rated protection mesh for frequent usage. Provides slip resistance and is great for daily use, residential / light commercial parking lots and heavy use foot paths. Vehicle rated protection mesh for regular traffic from lightweight to moderate weighted vehicles. Provides reinforced strength and increased slip resistance. Ideal for daily use residential parking areas commercial parking lots used by passenger vehicles. ADA Compliant. Ultra Heavy-duty reinforced plastic panels designed to be laid down where heavy machinery will be driving over lawn areas. 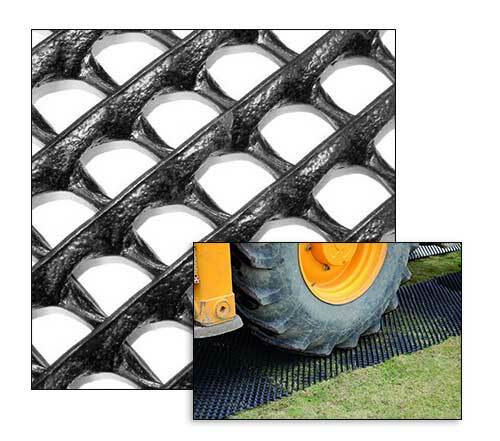 The durable plastic grid will help to protect grass from damage caused by rutting & turning tires and tracks. This material is designed to be reused and is not typically permanently installed. Ideal for daily vehicle traffic in residential or light commercial settings. Perfect for daily use commercial applications where frequent vehicular traffic is common. This protection mesh is an extruded-designed plastic mesh intended for the purpose of reinforcement, stabilization and protection of turf and grass. The turf and grass are mostly intended for occasionally trafficked, light vehicle and pedestrian applications. The mesh is very effective in stabilizing grass and once the grass and root system has grown through the mesh a natural look as well as a more strongly-reinforced grassed surface creates a very useful and ascetically pleasing grass surface. 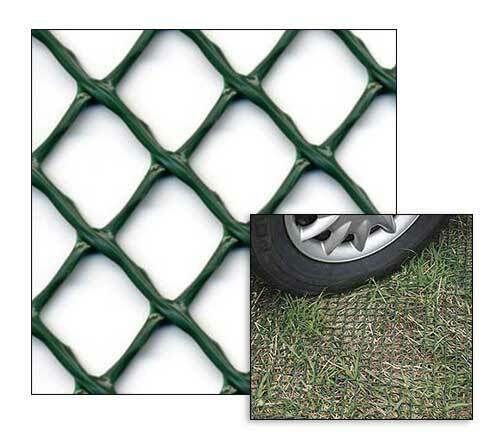 Grass protection mesh is unique as it does not require that the existing grass is removed prior to installation. Many other grass and ground reinforcement product on the market require the complete removal and reinstallation of the grass area. 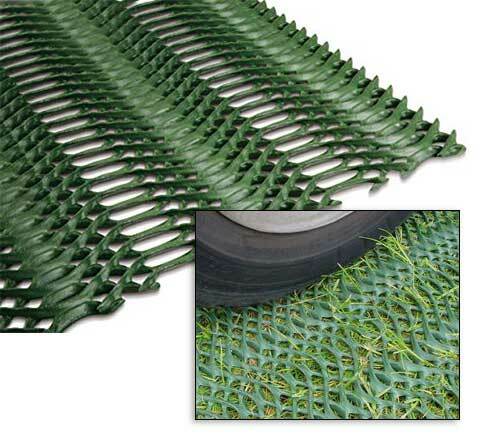 (This is to provide a very high load capacity which is not attainable by above grass meshes) For applications where heavy vehicles such as semi-trucks or fire engines will not be regularly driving, grass protection mesh is an ideal solution which will save on both the installation cost of the project and the overall material cost. 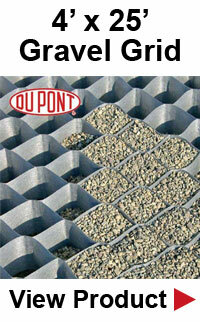 For a heavy-duty grass reinforcement solution which is capable of loads up to 97,000 pounds / sq. ft. see our selection of grass pavers. If the grassed area is used as a daily use parking lot or access road with regular vehicle traffic, it is recommended that the heavier grade product grasprotecta is considered, as it provides a higher weight rating. Grassprotecta requires a similar installation process and can be rolled onto of existing turf creating a highly reinforced area suitable for passenger vehicles as well as pedestrian traffic. Right after you have completely installed the mesh, you need to leave the plastic stabilization mesh area unused during the first growing season. The main purpose of doing this is to permit the roots of the grass to intertwine with the plastic-based mesh filaments. After the first season, the mash now disappears beneath the grass’ surface. It now offers a reinforced surface that can withstand the heavy weight of cars or the rigorous demand of continual foot traffic. Grass protection mesh type material is available in a number of different styles and thicknesses. This is mainly manufactured in HDPE Plastic and is mainly available in a green and black color. If you would like assistance choosing the right mesh for your project feel free to give us a call at (800) 524-4161. The grass protection mash, specifically the product mentioned, is intended for grassed areas. Ideal application areas for the product are those areas that are more prone to wet conditions and mud. The mesh can be slippery when first installed. This is due to the relatively smooth nature of the material. Traction for both vehicles and pedestrians will be greatly increased once grass has begun to grow through the mesh. 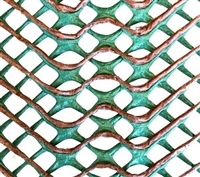 Until the root system has grown over the mesh, the plastic mesh may become especially slippery especially during wet conditions. It is advised that pedestrian traffic is diverted around the area until an above mesh root system is apparent or until enough grass has grown through to give significant traction. Through the use of a protection mesh, you’ll be able to improve the grassed surface around your area. It will also be protected against the wear and tear process, smearing and rutting. This actually results in the muddy surfaces with cars not capable of withstanding pedestrian or vehicular applications. This is specifically designed in increasing the traction and improving the slip resistance. When compared to other paver products, grass protection mesh is the most economical ground reinforcement solution on the market. The installation is quite simple that right after you have cut the grass short, unroll the mesh and stake with metal U pins into the grass. Allow the turf to grow through the mesh and establish a root base above the material. This now creates a reinforced and strong surface for a variety of purposes as listed above. This can surely withstand the weight of passenger vehicles as well as demanding foot traffic. It is recommended that the area is unused for the first growing season to allow for a solid root base to be established and also to increase traction. Many homeowners have used the mesh to protect their yards from damage caused by large dogs. Grass protection mesh is an excellent solution as it can be installed over existing grass to protect against rutting. The material can be staked and will stay in place nicely. If a softer grass surface is desired the material can be rolled up and stored, ready for the next use. The grids on the mesh are small enough to prevent most large dog's paws from getting getting stuck allowing for a safe surface for them to play. 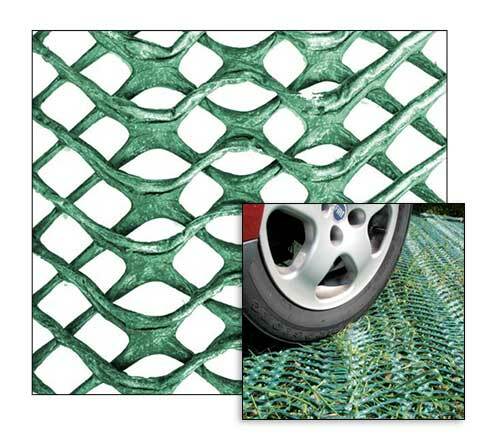 Grass Protection Mesh is available from Landscape Discount in a variety of different colors and styles. For more information or to place an order please call: (800) 564-4161.